My thumb was a failed attempt at Christmas lights - I definitely need more practise at freehand nail art. I used some more of the awesome water decals I found in HK and this time around it was much easier to use them. You can't really tell in this pic but I tore my left thumb nail today!! Pinky: 2 coats each of China Glaze Mistletoe Kisses and Party Hearty. Ring finger: Gold gradient nail using China Glaze Midnight Kiss for top 1/3 of the nail and 5 Golden Rings on top 2/3 of nail. 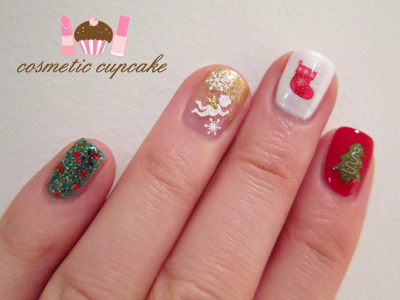 I then placed snowflake and angel nail stickers which I hauled in HK. Middle finger: 2 coats of Ulta 3 Lily White topped with 1 coat of China Glaze Frosty. You can see the lovely shimmer up close! Frosty was also fantastic over the white because it covered the streakiness of 2 coats hehe. I then placed a stocking water decal on top (also from HK). Index finger: 2 coats of China Glaze Ruby Deer and Christmas Tree water decal on top (also from HK). Thumb: 2 coats of China Glaze Sugar Plums as base. I then used CM nail art striper in Pearl to draw the wire and then used yellow, blue, red, metallic green polishes for the lights. I then topped it off with a coat of Color Club Vivid Color Intensifying topcoat (2 coats for some fingers). I very kindly received this from Color Club NZ and I'll be using it for my upcoming manis. So far so good! Do you get times when you've planned something fun and then it just doesn't evolve when you do your manicure? I hope this passes soon! EDIT: I also updated my "Where to buy" page tonight so take a look Aussie ladies! another beautiful mani sweety!! 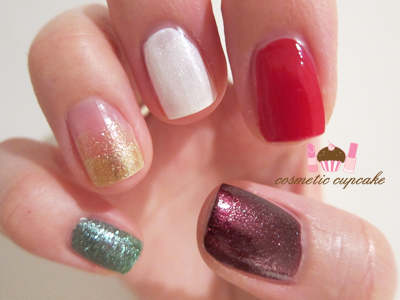 you really are very talented :) I especially love the sparkly gold ring finger with the angel & snowflakes, so pretty! Party Harty is so pretty! How pretty! I especially like the pinky and ring finger. so cute and pretty, i love it! These decals are a nice size to fit your nail, I definitely don't think you r thumb is a fail! Great Christmas mani! I've never tried doing something different on each nail, you make it work so well! They are so so cute! I'm looking for inspiration. I really like waht you did! @Aysh: You are very sweet Aysh. My sis and boyfriend give me a lot of ideas! I wish I would have had time to do a full mani with the gold gradient nail, it was my favourite. @Toesthattwinkle! : China Glaze outdid themselves with Party Hearty. It's such an awesome polish! @Thifa: Glad you like it hun! The ring finger design was my fave too. @Jenny: I seriously regret not stocking up on more of the Xmas decals. They are all so cute and easy to use! @Deniz: You are too kind Deniz! I think white and red go really well together, plus the stocking decal is so cute hehe. @Saori: Merry Christmas too Saori!! @Freshie: Ahhh thank you! I'm a perfectionist and it didn't look like Xmas lights to me haha. It's handy to have big nail beds when it comes to nail art! @boonDy: I hope you can use some of my mani ideas! I'm glad you like them! @Pammy: Thanks Pammy! The tree decal is definitely one of my favourites.